Add your pilot type ratings! We work with employers to post the newest, best and most up-to-date corporate pilot jobs daily to our site, but we find that there’s even more job “action” behind the scenes. 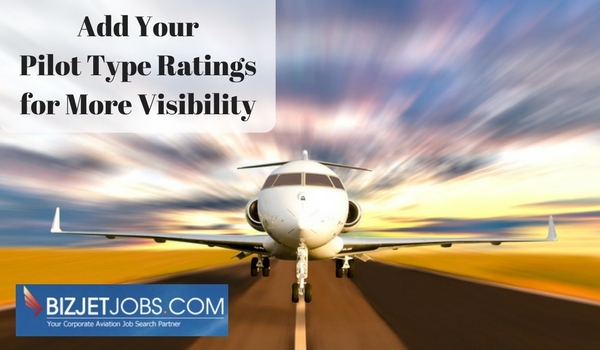 Just as it’s your responsibility to keep your credit card information up-to-date so you can see and apply for all the great jobs we post here at BizJetJobs, it’s also your responsibility to keep your type ratings up-to-date so employers can see you. This simple step is incredibly important if you’re serious about your job search. That’s because our corporate aviation Employer Members are searching our site daily based on pilot type ratings. They want the best and brightest pilots, so they are contacting them proactively through our site. So go ahead and add your type ratings right now! Step 5: Select Aircraft from the dropdown menu that appears. Step 6: Add your Aircraft, Time in Type, Training Date, Training Facility, Type of Training and Price Per Day (if applicable – all fields are optional). Click Save New Aircraft. Note: if you don’t see your type rating in the list, you can request it using our Contact Form or email [email protected]. When you navigate back to your Dashboard, you’ll see your new type ratings front and center – and employers will now have the ability to search for you by type rating. Check out the BizJetJobs.com Pilot Job Board for Corporate Pilots and Contract Pilots and get your pilot job search working for you today. Need additional motivation or have questions? Give us a call! We staff our support line from 9-5 ET and we love talking to pilots. This entry was posted in Career Advancement, How to Use BizJetJobs, Job Search, Networking, Pilot Jobs, Site Updates by Amanda Jenkins. Bookmark the permalink. Member Support Specialist at BizJetJobs.com, helping Aviation Crew navigate the job market and present themselves effectively to corporate employers.